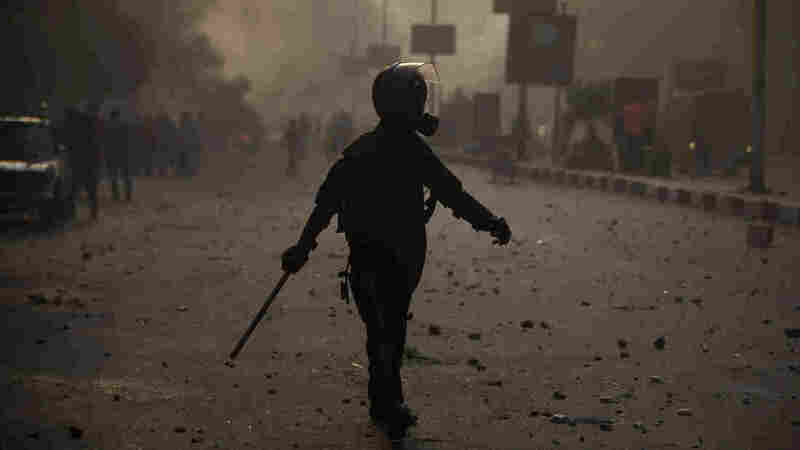 Violent Clashes Erupt In Egypt; At Least 51 Dead : The Two-Way In central Cairo, as well as other parts of Egypt, clashes broke out between supporters of the Muslim Brotherhood and the military-backed government on Sunday. An Egyptian riot policeman moves into position during clashes with supporters of ousted president Mohammed Morsi, in Cairo, Egypt on Sunday. In central Cairo, as well as other parts of Egypt, clashes broke out between supporters of the Muslim Brotherhood and the military-backed government on Sunday. NPR's Leila Fadel tells our newscast unit that at least 51 people are reported dead and more than 200 injured. Sunday's death toll was the highest on a single day since Aug. 14, when security forces raided two sit-in protest camps by Morsi supporters, killing hundreds. "As the military's supporters celebrated the anniversary in Tahrir Square in Cairo with music and fireworks, officers and armed civilian loyalists set upon Islamist protesters who were also trying to reach the square, driving back their marches with tear gas and gunfire." NPR's Fadel reports that as gunfire rang out, it was often unclear who was shooting. In addition to the deaths, she says hundreds supporters of ousted President Mohammed Morsi were arrested, accused of instigating riots. The fighting is the latest in a series of clashes between security forces and the Islamist group that put Morsi in power. Since July, hundreds of Brotherhood members have been killed and most of the movement's leaders have been sent to jail or fled the country.